Flying to Manchester? Well that’s just criminal! Fresh from watching his former adviser convicted of fraud yesterday, Boris Johnson faces further embarrassment with the revelation the celebrity cyclist flew to Manchester for the Tory party conference. The Mayor of London has made great play of his green credentials, but like his leader – whose briefcase-carrying car follows him wherever he bikes – charges of hypocrisy are never far away. 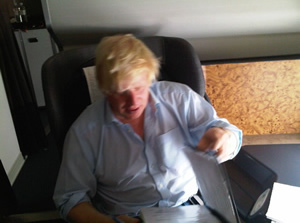 In February last year Mr Johnson described domestic flights as “criminal”. Our apologies to Mr Johnson, seems he travelled to Manchester by train after all. Looks like the Mayor’s IT team made a mistake in attaching the wrong picture when tweeting “On route to Manchester, drafting speech for party conference tomorrow” on Sunday morning. Dave Hill in the Guardian has more. He didn’t fly to Manchester, they just put the wrong picture up. Read the comments for the full story. Shamik, be careful here. You got rumbled on the difference between causality and correlation by reader Swagata recently. Now you’ve been done over by single source reporting – it pays to check, especially from two sources. I’d imagine that’s what an “evidence based” approach involves? It’s one thing to look for hypocritical Tories but it’s another to be so dedicated to attack politics that you pump out nonsense. I know blogging can be rapidfire at times but… higher standards please! Agree it should be taken down – are you or are you not a serious fact-based site? And its hardly as if there is a lack of anti-Boris material that is actually true.